The question of democratic education arises continuously and is taking on new dimensions in all countries that have to deal with international performance assessments such as PISA, as well as with the requirements of a global management of national educational reforms introduced by the OECD, the World Bank, the WTO and the EU. Likewise, in Germany and Turkey education policy is subject to an ongoing debate. This debate involves applied pedagogy, teacher training, study regulations and the local infrastructure of day care, youth welfare, day school and inclusive education. The following introduction outlines this matter by presenting a collection of portraits of students and professionals from Germany and Turkey and by discussing several relevant topics found in the collection. 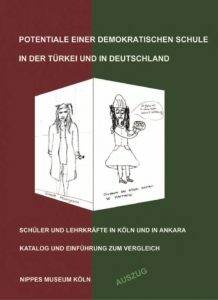 The exhibits show drawings and corresponding narratives that provide a deeper understanding of the image of school in Turkey and Germany. In workshops held in Cologne and Ankara participants were able to produce drawings and narrate about their chosen topics. The resulting exhibits give an impression of the history as well as showing new developments of education policy from the viewpoint of the actual actors. The drawings challenge stereotypical images of both countries, their school systems, education, youth and migration. The shift in perspective towards actual life situations and professions serves as a means to deduce qualitative criteria for an international comparison. These criteria are drawn from the narratives and feedbacks as well as from cooperating with groups of students and teachers in a process of evaluating and comparing the findings. An initial collection depicting school and education in Ankara was put together in 1996, shortly before the extension of compulsory education in Turkey from five to eight years. 220 portraits of pupils from five different Turkish schools, interviews with teachers and members of the Turkish Teachers’ Union as well as of the teacher’s association Eǧit-der, and photographs showing the history of the Turkish Village Institutes provided by the Education Museum in Ankara create awareness for a Turkish tradition of progressive and democratic education and teacher training – a fact which often attracts less attention in Germany today. At that time, social and political differentiation, the continuity of the Kemalism and the concurrency of up-to-date topics on youth and environment already contradicted the prevalent image of a cultural difference in social practice and led to misunderstandings concerning the perception of children who grew up in Germany. A comparison of the pupils’ and professionals’ work orientation served as useful heuristics for an international comparison. The collection of new exhibits in Ankara started in 2012 after the introduction of the twelve year compulsory education in Turkey. 120 drawings with corresponding interviews of pupils as well as impressions from group discussions of professionals tell stories of expanding preschools and vocational colleges, of social stratification and the increasing educational advancement of girls, but also of an understanding of success according to or contrary to international standards. Since the beginning of the school year 2014/15 the collection has been continued by way of conducting similar workshops with groups of pupils from Cologne schools. Thus, a growing number of exhibits from different types of schools (Hauptschule, Realschule, Gymnasium, Gesamtschule, Berufsschule) has been added to the collection. An international comparison examines not only different life situations but also unexpected similarities and political as well as sociological convergence. A special thanks goes to the 300 pupils and professionals from 13 schools in Cologne and Ankara for contributing to the new collection, as well as to the Consulate General Köln-Hürth and the Turkish Ministry of National Education, who authorized drawing and interview workshops in Ankara and facilitated the contact with cooperation partners. The research in Ankara was promoted by a program of the Federal Ministry of Family Affairs, Senior Citizens, Women and Youth funding academic exchange of professionals. The Federal Office for Migration and Refugees supported a similar project in Cologne. It included several workshops and the compilation of the collection as well as the visitor’s guide funded by the European Integration Fund. Two qualified teachers from Cologne, Birsen Akdemir and Abdullah Atilgan, took part in the excursion and conducted the interviews in Ankara together with the team. Commissioned by the supervisory school authority in Ankara, Nurittin Yildiran, a teacher of German who knows his way around Ankara and who had already been part of a similar project 20 years ago, supported the new project as well. Acuner, S. 2012: Gender and development in Turkey, in: Turkish Policy Quarterly. Akalin, A. 2007: Hired as a Caregiver, Demanded as a Housewife: Becoming a Migrant Domestic Worker in Turkey 2007, in: European Journal of Women’s Studies 2007; 14; 209, http://ejw.sagepub.com/content/14/3/209. Al, U. / u.a. 2015: Public Libraries in Turkey, in: Journal of Librarianship (2015)7. Alisinanoglu, F. / Inan, H. Z. / Özbey, S. / Usak, M. 2012: Early childhood teacher candidates qualifications in science teaching, in: Energy Education Science and Technology Part B: Social and Educational Studies, Vol. 4, (12). Arendt, H. 1993: Die Aporie der Menschenrechte, in: Elemente und Ursprünge totalitärer Herrschaft, München, S.452-70. Fachstelle für internationale Jugendarbeit der Bundesrepublik Deutschland e. V. (Hg.) 2011: Monitoring Jugend und Jugendpolitik in der Türkei, Deutsch-Türkische Zusammenarbeit in der Jugendpolitik nach der Einrichtung des Jugend- und Sportministeriums. Aver, C. 2013: Aktueller Stand der türkisch-syrischen Beziehungen, in: Stiftung Zentrum für Türkeistudien und Integrationsforschung (ZfTI), Aktuell. Benhabib, S. 2014: Menschenrechte und die “Kritik der humanitären Vernunft”. Vortrag an der Universität Köln am 19.4.2014, in: dies. 2016: Kosmopolitismus ohne Illusionen, Frankfurt/M., S. 216-278. Boynikoglu, F. 2012: Konzeptionen integrativer Erziehung in Deutschland und in der Türkei, Diss., München. Bozcaga, T.: Women and the welfare state regime of turkey, in: Turkish Policy Quarterly. Bundesministerium für Bildung und Forschung BMBF (Hg.) 2012: Bildung in Deutschland 2012. Ein indikatorengestützter Bericht mit einer Analyse zur kulturellen Bildung im Lebenslauf. BMBF (Hg.) 2016: Steuerung im Bildungssystem, Bildungsforschung Band 43, S.137-76. Busemeyer, M.R. / u.a.(Hg.) 2013: Wohlfahrtspolitik im 21. Jahrhundert. Neue Wege der Forschung, Frankfurt/M, / N.York. Busemeyer, M.R. 2015: Bildungspolitik im internationalen Vergleich, Konstanz / München. Cayir, K. / Gürkaynak, I. 2007: The State of Citizenship Education in Turkey: Past and Present, in: Social Science Education 6(2007)2, S.50-58. Dereli, T. 2012: Flexicurity and Turkey’s new labour act: Problems and Prospects, Istanbul / http://ilera2012.wharton.upenn.edu/RefereedPapers/DereliToker%20ILERA.pdf. Deutsch, K.W. 1969: Politische Kybernetik, Rombach. Dulupcu, M. A. 2005: Regionalization for Turkey: An Illusion or a Cure? in: European Urban and Regional Studies (2005) http://eur.sagepub.com/cgi/content/abstract /12/2/99. Economist Intelligence Unit 2010: Country Report Turkey (10) 11. Elveren, A. Y. 2008: Social Security Reform in Turkey: A Critical Perspective 2008, in: Review of Radical Political Economics 2008; 40; 212 http://rrp.sagepub.com/cgi/content/abstract/40/2/212. Europäisches Netzwerk für Sozialpolitik ESPN 2016: Flash Report 21. European Commission 2014: Instrument for Pre-accession Assistance (IPA II) – Indicative Strategy Paper for Turkey 2014-2020 adopted on 26/08/2014. Fend, H. 2008: Schule gestalten. Systemsteuerung, Schulentwicklung und Unterrichtsqualität, Wiesbaden, S. 27-50. Fend, H. 2014: Die Wirksamkeit der neuen Steuerung. Theoretische und methodische Probleme ihrer Evaluation, in: Maag Merki, K. / Langer, R. / Altrichter, H. 2014: Educational Governance als Forschungsperspektive, Wiesbaden 2014/2., S. 27-50. Friedrich Ebert Stiftung 2012: Türkei Nachrichten. Forum 21 (Jugendhilfe Türkei) o.J. : http://www.coe.int/t /dg4/youth /Source /Resources/Forum21/Issue_No3 /N3_Turkey_de.pdf. Garot, R. 2013: The Psycho-Affective Echoes of Colonialism in Fieldwork Relations, in: Forum Qualitative Sozialforschung, 15 (1), Art. 12. http://nbn-resolving.de /urn:nbn:de:0114-fqs1401125. Göksel, A. 2005: Studies on youth policies in the mediterranean partner countries, Turkey. Görgülü, R. S., Dinc 2007: Ethics in Turkish Nursing Tansel, A. 2013, Supplementary Education in Turkey: Recent Developments and Future Prospects, in: European Research Council ERC 2013: Working Papers in Economics 13/10.Education Programs 2007, in: Nursing Ethics 2007; 14; 741, http://nej.sagepub.com/cgi/content/abstract/14/6/741. Götsch, M. / Klinger, S. / Thiesen, A. 2011: “Stars in der Manege?” Demokratietheoretische Überlegungen zur Dynamik partizipativer Forschung, in: Forum Qualitative Sozialforschung / Forum: Qualitative Social Research, 13(1), Art. 4 – http://www.qualitative-research.net. Grauhan, R.R. 1978: Kommune als Strukturtyp politischer Produktion, in: Grauhan R.R. / Hickel, R., Krise des Steuerstaats 1978. Groh-Samberg, O. / u.a. 2014: Investieren in den Status. Der voraussetzungsvolle Lebensführungsmodus der Mittelschichten, in: Leviathan 42(2014)2, S.219-248. Gürses, D. 2009: An Analysis of Child Poverty and Social Policies in Turkey 2009, in: Journal of Developing Societies 2009; 25; 209, http://jds.sagepub.com/content/25/2/209. Halicioglu, M. 2008: The IB Diploma programme in national schools: The case of Turkey, in: Journal of Research in International Education 2008; 7; 164, http://jri.sagepub.com/cgi/content/abstract/7/2/164. Heisenberg, W. 1984: Physik und Erkenntnis 1956-1968, GW II, München / Zürich. Hasso, F. S. 2006: Book Review: The Myth of the Military-Nation: Militarism, Gender and Education in Turkey, in: Gender & Society 2006; 20; 134 – http://gas.sagepub.com. Hocker, R. 1996: Schule, Lehrerausbildung und Pädagogik in der Türkei 1928-48, in: Nippes Museum 1996a, S. 15-39. Informationen zur politischen Bildung 2002, Türkei Internationaler Jugendaustausch- und Besucherdienst der Bundesrepublik Deutschland e. V. 2005/2006, Abschlussbericht: Jugendmigrationsarbeit in Türkei und Deutschland. Isik, N. E. 2013: Parables as indicators of popular wisdom: The making of piety culture in Turkish television dramas, in: European Journal of Cultural Studies (13) 7, http://ecs.sagepub.com/content/16/5/565. Iversen, T. / Stephens, J.D. 2008: Partisan Politics, the Welfare State, and Three Worlds of Human Capital Formation, in: Comparative Political Studies 41(2008). Jessop, B. 2016: The State. Past, Present, Future, Cambridge / Malden MA 02148 USA, p.140. Kandir, A. / Özbey, S. / Inal, G. 2009: A study on the difficulties faced by preschool teachers in the planning and implementation, in: The Journal of International Social Research, Vol. 2/6, 2009. Kaya, I. 2012: Conceptualizing the current clashes between modernist republicans and Islamic conservatives in Turkey, in: Social Science Information 2012; 51; 3, http://ssi.sagepub.com/content/51/1/3. Klees, St.J. 2008: A Quarter Century of Neoliberal Thinking in Education: Misleading Analyses and Failed Policies, in: Globalisation, Societies and Education 6(2008)4, p.311-48. Klein, M. 2016: Educational Expansion, Occupational Closure and the Relation between Educational Attainment and Occupational Prestige over Time, in: Sociology 50(2016)3, p.3-23. Klemm, K. / Schneider, K., Wuppertaler Institut für bildungsökonomische Forschung 2016: Zweiter Bericht zur Evaluation des Gesetzes zur Förderung der kommunalen Aufwendungen für die schulische Inklusion. in: Landtag NRW Drucksache 16/4321 vom 18.10.2016. Koc, Y. / u.a. 2007: Elementary school curriculum reform in Turkey 2007, in: International Education Journal, 8 (1), 30-39. Kristen, C. / Reimer, D. / Kogan, I. 2008: Higher Education Entry of Turkish Immigrant Youth in Germany 2008 in: International Journal of Comparative Sociology 2008; 49; 127 http://cos.sagepub.com/cgi/content/abstract/49/2-3/127. Lampert, W / Hoff, E. / Lappe, L. 1979: Konzeptionen zur Analyse der Sozialisation durch Arbeit, Materialien aus der Bildungsforschung 14, Berlin: Max-Planck-Institut für Bildungsforschung FQR 1-17. https:// www.mpib-berlin. mpg.de/de/dl/Materialien/index.php?nummer=14. Liebscher, D. / u.a. 2012: Wege aus der Essentialismusfalle, Überlegungen zu einem postkategorialen Antidiskriminierungsrecht, in: Kritische Justiz (2012)2, S.204-18. Mc Bride, S. / Merolli, J. 2013: Alternatives to austerity? Post-crisis policy advice from global institutions, in: Global Social Policy 13(3), http://gsp.sagepub.com/content/13/3/299. Madeker, E. 2008: Türkei und europäische Identität, Wiesbaden. Meier, M. G. 1988: Bildung – Eine Chance für das Schwellenland Türkei? Diss. Augsburg 1987, Berlin 1988. Mendelski, M. 2016: Das europäische Evaluierungsdefizit der Rechtsstaatlichkeit, in: Leviathan 44(2016)3, S. 366-98. Mercer, R. 1989: And now for the Soaring Turkeys: Managing the Implementation of the 1988 Education Reform Act, in: Educational Management Administration & Leadership 1989; 17; 55 http://ema.sagepub.com/content/17/2/55. Milli Egitim Bakanligi / Republik of Turkey Ministry of National Education 2012-2013: National Education Statistics, Formal Education. Möller, M. 1997: Das “Neue Steuerungsmodell”: Konsequenzen für die soziale Arbeit, in: Zeitschrift für Sozialreform 43(1997)9, S. 685-703. Mückenberger, U. 2010a: Krise des Normalarbeitsverhältnisses – ein Umbauprogramm, in: Zeitschrift für Sozialreform 56(2010)4, S. 403-20. Mückenberger, U. 2010b: Demokratische Einhegung der Globalisierung – Neue Akteurskonstellationen bei globalen Normbildungsprozessen, in: Kritische Justiz 43(2010)1, S. 38-45, 41. Münch, R. 2009: Globale Eliten, lokale Autoritäten – Bildung und Wissenschaft unter dem Regime von PISA, McKinsey & Co., Frankfurt/M. Nippes Museum 1996a: Das Bild der Erziehung in der Türkei und in Deutschland. Dokumentation einer Fachveranstaltung zur interkulturellen Woche 1995, Köln. Nippes Museum 1996b: Das Bild der Schule und der Erziehung in der Türkei und in Deutschland. Katalog zur Sammlung Ankara, Köln. Nebigil, I. / Hizel, S., Tanyer, G., Dallar, Y. / Coskun, T. 1997: Brief Reports, Heights and Weights of Primary School Children of Different Social Background in Ankara, Turkey, in: Journal of Tropical Pediatrics, Vol. 43, 1997. Nohl, A.-M. u.a. (Hg.) 2008, Education in Turkey, Münster / N.Y. / München / Berlin. OECD 2016a: PISA 2015: Excellence in Education, Paris. OECD 2016b: Education at a Glance, Paris. OECD 2016c: Society at a Glance, Paris. Önder, Z. / u.a. 2009: Banks, regional development disparity and growth: evidence from Turkey, in: Verbundzentrale des GBV (VZG) Oyvat, C. 2010, Globalization, wage shares and income distribution in Turkey, in: Cambridge Journal of Regions, Economy and Society (2011)4. Otte, M. 1994: Das Formale, das Soziale und das Subjektive. Eine Einführung in die Philosophie und Didaktik der Mathematik, Frankfurt/M. Özbay, Ö. / Özcan Y. Z. 2006: A Test of Hirschi’s Social Bonding Theory: Juvenile Delinquency in the High Scholls of Ankara, Turkey, in: International Journal of Offender Therapy and Comparative Criminology 2006; 50; 711 http://ijo.sagepub.com/cgi/content/abstract /50/6/711. Özbey, S. / Alisinanoglu, F. 2008: Identifying the General Ideas, Attitudes and Expectations Pertaining to Science Activities of the Teachers Employed in Preschool Education, in: Journal of Turkish Science Education, Vol. 5, (08) 8. Özbey, S. / Alisina Noglu, F. 2009: A study on problem behavior of 60-72 months children who attending public early childhood education institution, in: The Journal of International Social Research, Vol. 2/6, 2009. Ozcan U. R. 2013: Translating travelling ideas: The introduction of unemployment insurance in Turkey, in: Global Social Policy (2013)3, http://gsp.sagepub.com/content/13/3/239. Özdemir, E. 2006: The EU in the eyes of Turkish youth, in: Özman, A. 2010: Law, ideology and modernization in Turkey: Kemalist legal reforms in perspective, in: Social & Legal Studies, Vol. 19(1). Özveren, E. / Efsan Nas, S. 2012: Economic development and environmental policy in Turkey: an institutionalist critique, in: Cambridge Journal of Economics, 2012, 36. Press Release Concerning the Judgment on Exclusion of private Tutoring Centres from the Scope of private Teaching Institutions, Press Release Nr: Plenary Assembly 5/15 24/7/2015 – http://www.anayasa.gov.tr/en /About/Press/PressReleases/Detail/8/. Rankin, B. / Ergin, M. / Göksen, F. 2013: A Cultural Map of Turkey, in: Cultural Sociology (13) 7 http://cus.sagepub.com/content/early/2013/07/10/1749975513494878. Reinholz-Asolli, C. 2011: Die neue Jugendpolitik der Türkei, in: Monitoring, Fachstelle für internationale Jugendarbeit, Bonn. Rösch, H. / u.a. 2009: Bibliografie deutschsprachige Migrationsliteratur mit Kurzporträts. Sabanci, A. 2008: School Pricipals’ Assumptions about Human Nature: Implications for Leadership in Turkey, in: Educational ManagementAdministration Leadership 36(2008) S.511 http://ema.sagepub.com /cgi/content/abstract/36/4/511. Sum, N.-L. / Jessop, Bob, 2013: Competitiveness, the Knowledge-Based Economy and Higher Education, in Journal of Knowledge Economy (2013)4:24-44. Schuß, H. 2012: Die politische und wirtschaftliche Entwicklung der Türkei, in: Geographie und Schule, 34 (2012) 197, S. 4-9. Schwartz, I. 2012: Educational Governance in der Türkei und Deutschland. Transformation nationaler Bildungssysteme unter dem Einfluss zivilgesellschaftlicher, inter- und transnationaler Akteure. Sekretariat der Ständigen Konferenz der Kultusminister der Länder in der Bundesrepublik Deutschland. Dies. 2014, Das Bildungssystem der Türkei. Schulische Bildungslandschaft, nationale, internationale und zivilgesellschaftliche Einflussfaktoren, in: Kreiser K. / u.a. (Hg.) 2014: Junge Perspektiven der Türkeiforschung in Deutschland, 2014 http://www.academia.edu/download/34468222/Educational_Governance_ in_Turkey.pdf (13.12.2016). Dies. 2014: Anthropology of governance in education : Indigenisierung alternativer Bildungskonzepte in der Türkei , Diss. Tübingen, Berlin LIT. Spiegel-Titel „Gefährlich fremd“ – 16-14.4.1997. Spiegel Spezial 1-2016: Brennpunkt Türkei, 13.9.2016. Stadt Köln 2012: Inklusionsplan der Stadt Köln und Fortschrittsberichte bis 2016. Statistisches Bundesamt 2012Ö: Statistisches Jahrbuch, Deutschland und Internationales, 2012. Statistische Veröffentlichungen der Kultusministerkonferenz, Dokumentation Nr. 196, 2012, Sonderpädagogische Förderung in Schulen 2001-2010. Tansel, A. 2013, Supplementary Education in Turkey: Recent Developments and Future Prospects, in: European Research Council ERC 2013: Working Papers in Economics 13/10. Tekin, B. C. 2008: The construction of Turkey’s possible EU membership in French political discourse 2008, in: Discourse & Society 2008; 19; 727 http://das.sagepub.com/cgi/content/abstract/19/6/727. Topak, Ö.E. 2013: Governing Turkey’s information society, in: Current Sociology (13) 7 http://csi.sagepub.com/content/61/5-6/565. Tudyka, K. / Zaschke, W. 1993: Internationale Verrechtlichung der Sozialpolitik, in: Wolf, K.D. (Hg.) 1993: Internationale Verrechtlichung, Pfaffenweiler. Tullius, K. / Vogel, B. / Wolf, H. (Hg.) 2016: Gerechtigkeitsansprüche und Arbeitnehmerbewusstsein heute – neue Ansätze, neue Befunde, WSI-Mitteilungen Schwerpunktheft 69(2016)7, S.492. Türkiye Istatistik Kurumu / Turkish Statistical Institue 2011: Istatistiklerle Genclik, Youth in Statistics. Türkiye Istatistik Kurumu 2011 / Turkish Statistical Institue 2011: Kültür Istatistikleri, Cultural Statistics. Türkiye Istatistik Kurumu 2010-11 / Turkish Statistical Institue 2010-2011: National Education Statistics, Non-Formal Education. Ügeöz, P. 1992: Erziehung im Aufbruch. Die Dorfinstitute in der Türkei, Berlin. Urbina-Feretjans, M. / Surender, R. 2013: Social policy in the context of new global actors: How far is China’s developmental model in Africa impacting traditional donors? in: Global Social Policy 13(3), http://gsp.sagepub.com/content/13/3/261. Uyar, M. / Varoglu, A. K. 2008: In Search of Modernity and Rationality: The Evolution of Turkish Military Academy Curricula in a Historical Perspective 2008, in: Armed Forces & Society 2008; 35; 180 http://afs.sagepub.com /cgi/conten t/abstract/35 /1/180. Vassaf, G. Y. H. 1980: Pre-School Education in Turkey: The Failings of a Non-community Approach, in: School Psychology International 1980; 1, 10 http://spi.sagepub.com/content/1/5 /10. Vester / u.a. 2001: Soziale Milieus im gesellschaftlichen Strukturwandel, Frankfurt/M. Vismann, C. 2012: Menschenrechte: Instanz des Sprechens – Instrument der Politik, in: dies., Das Recht und seine Mittel, Frankfurt/M. 2012, S. 228-252. Waldow, F. 2016: Das Ausland als Gegenargument. Fünf Thesen zur Bedeutung nationaler Stereotype und negativer Referenzgesellschaften, in: Zeitschrift für Pädagogik (2016)3 – Berufsbildungssysteme im Wandel: Ansätze zur Flexibilisierung des dualen Systems in Deutschland, S.403-21, Weinheim. Wasti, S. A. / u.a. 2008: Six Turkish Personality Factors and the HEXACO Model of Personality Structure 2008, in: Journal of Cross-Cultural Psychology 2008; 39; 665 http://jcc.sagepub.com/cgi/content/abstract /39/6/665. Yakut-Cakar, B. / Erus, B. / Adaman, F. 2012: An inquiry on introducing a minimum income scheme in Turkey. Alternating between cost efficiency and poverty reduction, in: Journal of European Social Policy 22(2012) S.305 http://esp.sagepub.com/content/22/3/305. Yalvac, F. 2012: Strategic Depth or Hegemonic Depth? A Critical Analysis of Turkey’s Position in the World System, in: International Relations 26(2012) S.165 http://ire.sagepub.com/content/26/2 /165. Yildirim J. / Sezgin, S. 2002: Defence, Education and Health Expenditures in Turkey, 1924-96, in: Journal of Peace Research 2002; 39; 569 http://jpr.sagepub.com/cgi/content/abstract/39/5/569. Yilmaz, B. T. 2016: Towards a new pattern of youth participation, in: Turkish Policy Quarterly, Spring 2016. Yilmaz, H. 2011: Learning to read (again). The Social Experiences of Turkey’s 1928 Alphabet Reform, in: Int. J. Middle East Stud. 43 (2011). Tansel, A. 2013, Supplementary Education in Turkey: Recent Developments and Future Prospects, in: European Research Council ERC 2013: Working Papers in Economics 13/10. Yinanc, B. 2013: Constant changes in Turkey’s education system confounding all stakeholders 2013, in: Hurriyet Daily News 2013 (11). Zaptcioglu, D. 2013: Die Türkei vor der Demokratiefrage, in: Blätter für deutsche und internationale Politik, 7(2013). Zaschke, W. 2006: Sprachförderung als Ausgrenzungsinstrument. Die Verantwortung der Kommunen, in: Neue Praxis (2006)6, S. 647-657. Zaschke, W. 1990: Die Analyse internationaler Politikfelder in der liberalen Schule. Am Beispiel der internationalen Sozialpolitik, Nijmegen, http://repository.ubn.ru.nl/bitstream/handle/2066/113809/mmubn000001_103109498.pdf. Zhou, Y. R. 2013: Toward transnational care interdependence: Rethinking the relationships between care, immigration and social policy, in: Global Social Policy (2013)9 http://gsp.sagepub.com/content/13/3/280.